How to know if your company is ready to take on sustainable practice. ACFC look at aligning all business verticals to integrate development in CSR strategy. Heads of leadership and stakeholders are pivotal underpinnings to best practice implementation and benchmarking measurements. Responsible impact can only be felt through a unanimous approach. Typically large fashion companies rely on buying managers design approval before production. By connecting decision makers and teams in supply and design, we can apply modern processes to update the linear production model to design for ‘end-in-mind’ – circular design systems. Arming middle management with the power and ability to approve evolutionary design in the supply chain will dramatically shift the internal paradigm to conscious practice. It’s time to design for end-in-mind. 10.35 – 11.05am 11.15 – 11:45pm University Participants: RMIT, MASSEY (NZ), QUT Industry Participants: ALDI, SALVOS, THE WOOLMARK COMPANY The Circular Fashion Strategies Hackathon is an unrivalled design-thinking challenge across Australasia’s major Universities. 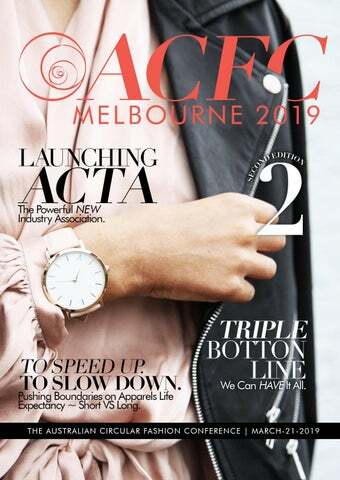 Held within the framework of the ACFC the challenge is an integral component for the future of fashion in Australasia, igniting new initiatives for the future of fashion and textiles. Recycled materials use between 33%-53% less energy to produce compared to virgin.1 Providing understanding behind investment in sustainable procurement and recycled fibres. The greatest barrier to supplementing sustainable fabrics in production is cost – we need to support a system which allows companies to trade new fabrics within the market and reduce the cost. Fashion is under an enormous amount of scrutiny. Post-consumer textile waste has reached tipping-point, collaborative action is required now from companies in waste recovery and logistics to connect industry and consumer. Australia is the second largest consumer of apparel next to the USA and textile waste is flagged as problematic in landfill. A clear directive for stewardship in pre+post consumer must be recognised within every level of the sector. 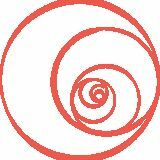 We’re looking to improve the bottom line and close the loop. Fashion brands and retailers are facing challenges in a heightened competitive market. One of the biggest barriers in acknowledging sustainability is communication between companies, consumers and stakeholders. Companies validating positive social impact implores huge credibility with customers, driving widespread acceptance which is integral to growth. Patagonia’s ‘Don’t buy this jacket’ campaign was the brands most successful strategy, dramatically increasing customer retention and loyalty. Patagonia is a leader because of their social impact marketing on environmental care. “SUSTAINABLE FABRICS & GARMENTS” - CAN BE BEAUTIFUL & PERFORM. CONSUMERS CAN ACT BY: –	Using wash bags when washing synthetic clothing; –	Purchasing a front-loading washing machine, known to be gentler on clothes, thereby preventing excessive fibre loss; –	Choosing a washing machine with an inbuilt microfibre filter; –	Retrofitting an existing washing machine with an outlet pipe filter; –	Using a laundry ball, such as a Cora Ball, which catches microfibres in each wash; –	Purchasing clothing made from natural fibres such as cotton. An environmental scientist, facilitator and broadcaster, Donna has been active in the waste and resource recovery sector for the past decade. She is a collaborator who has worked within and across government, industry and community to develop solutions for waste issues, including the growing field of microplastics and marine debris. THE HACKATHON OFFERS UNIVERSITY STUDENTS VITAL EXPERIENCE WORKING WITH INDUSTRY.